Rumors that the haunted boy had actually lived at 3210 Bunker Hill Road in Mount Rainier have been around since the early 80s and have mostly been spread by neighborhood teens and newcomers to the area, who have raised the aura surrounding this location to urban legend proportions. I went back to the literature and determined that the first printed references to this address appeared in The Prince Georges Sentinel articles of February 4, 1981 and October 28, 1983. No definitive source for that address information was given. The next article to highlight this location, The Washington Post of May 6, 1985, quoted Father Bober as saying that Father Hughes never told him exactly where the boy lived. 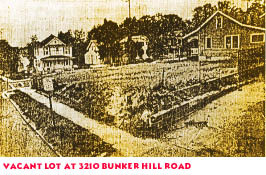 In fact, there is no printed reference to Father Hughes ever having identified 3210 Bunker Hill Road as the boys home. These articles set the rumors in motion, but none could positively confirm that address as the boys home. Furthermore, if the diary kept by the Jesuit priests had mentioned 3210 Bunker Hill Road, then Thomas B. Allen certainly would have cited that in his book. He doesnt, but instead cites The Prince Georges Sentinel article of February 4, 1981 as his source. He goes on to say that the diary gives another address for the family, about a half mile away, leading him to infer that the family moved from Mount Rainier. I realized, however, that there was no evidence demonstrating that the family ever lived in Mount Rainier in the first place. Something was amiss. The first stop on my mission to determine who it was that really lived at the Mount Rainier address of 3210 Bunker Hill Road was the Hyattsville Branch Public Library in Prince Georges County, a facility that would become my base of operations for the duration of my search. It was there that I found an extremely rare copy of the Prince Georges County Metropolitan Directory of the Mt. Rainier-Hyattsville-College Park Area, published in 1950 by C. E. Wooten. This directory listed the families and their phone numbers according to their street addressan unusual and highly effective method of tracking the local population. Looking at the entries for Bunker Hill Road, Mount Rainier, I scanned down the listings until I found 3210 and discovered the listed occupants as being Joseph Haas and Grace Miller. Miller, Martina Gregory3226 Bunker Hill Road, Mount Rainier, Maryland. 08 Jun 1926. (Note Evening Star 07 Jun 1926 p. 9 reports died on 06 Jun 1926 at the residence of her daughter Mrs. Joe S. Haas, 3226 Bunker Hill Road, Mount Rainier, Maryland.) Wife of the late Lemuel E. Miller (Morristown, NJ papers). This entry clearly states that Joseph Haas and his wife were in a house on Bunker Hill Road in 1926. While at the Historical Society Library, I next checked the Atlas Of Prince Georges County, Maryland, Volume 1, a large bound collection of maps published by the Franklin Survey Company of Philadelphia, Pennsylvania in 1940. Indeed, the map listed in detail all of the houses and their respective address numbers in Mount Rainier and the home at 3226 Bunker Hill Road sat right on the corner of 33rd Street. It was in the exact location of the vacant lot where 3210 was said to have stood. I was later told by Susan G. Pearl of the Maryland National Capital Park and Planning Commissions Historic Preservation Division that all of Mount Rainiers house numbers, along with many street names, were changed in 1942, a move that was also enacted in many neighboring communities including Cottage City. There was no question that 3226 Bunker Hill Road and 3210 had been one and the same house. My research, then, has revealed beyond any doubt that Joseph Haas lived in the house at 3210 Bunker Hill Road from at least 1926 through at least 1950. Common sense would then dictate that the possessed boy was a son of Mr. Joseph Haas. That is, if this were the actual site, as was almost universally accepted. I began scouring the microfilm newspaper holdings at the Hyattsville Branch Public Library and found that they had a complete run of The Prince Georges Post newspaper, a weekly that was published in Hyattsville, Maryland and dated back to 1932. I read every copy from 1932 to 1984 and discovered to my amazement that every issue had, without fail, a large number of neighborhood reports written by local residents that focused on the countys individual towns and included all the local gossip and newsworthy tidbits. Columns on Mount Rainier, Brentwood, Cottage City, and Hyattsville (along with numerous others) were in every issue and I began intensely searching these columns for information on Joseph Haas and the possession case in general. No survivors to Joseph Haas were listed. It was clear that he never had any children, hence the haunted boy could never have lived at 3210 Bunker Hill Road. I needed corroboration and instinctively checked the 1950 directory to see who else had lived on Bunker Hill Road at that point in time. There were ten homes listed in the 3200 block and, given the tremendous demographic change that had transformed Prince Georges County over the last thirty years, I realized that the chance of locating someone who remembered the Haas household was slim. I noted that Richard and Irene Ashton were listed as living at 3208 Bunker Hill Road in 1950 and after a little legwork in the community I located their daughter Peggy Lanahan. It was a big, old, three-story house. [Note how this description drastically differs from the one-and-one-half story home description given by the August 10, 1949 The Evening Star, Washington, D.C. newspaper account.] It was gray and drabdidnt have a coat of paint on itand looked like a haunted house. There was never any talk of a possessed boy living there. The first story I ever saw about it was the movie itself. I went to a class reunion and my girlfriend at the time, who used to live in Mount Rainier also, said to me,Did you see the article in the newspaper? That exorcism took place in the house next to you. I said, No, it couldnt have been there because how could something like this happen next door and none of us know anything about it? Especially since I was taking piano lessons in there every day. None of the neighbors ever mentioned it. I told her it couldnt have been there. She showed me the article and there was a picture of the lot on the corner and our old house in the background and I couldnt believe it. They are wrong! From published information in The Prince Georges Post and documents on file at the University of Maryland Fire and Rescue Institute I was able to determine that the house at 3210 Bunker Hill Road was burned down in March 1962 (which differs from the date of April 1964 given by Thomas Allen in his book Possessed) as the final training class exercise of the Section II Advanced Training Course in Firemanship, a program for firefighters offered through what was then called the Fire Extension Service of the University of Maryland. The burning of the house was completed under the supervision of University of Maryland senior instructors Matthew Dillon and Robert Smith, with the cooperation of the Mount Rainier Fire Department. Representing Mount Rainier were Chief Francis Xander, Deputy Chief John Fisher, and Captain Karl Young. Firefighters from neighboring departments such as Brentwood, Cottage City-Colmar Manor, and Hyattsville were also invited to participate, with about four-dozen men eventually taking part in the festivities (including the 18 training class students). While the top three 1962 fire officials from Mount Rainier have all passed away and no one on Mount Rainiers current force was an active member, I had little difficulty locating firemen who did participate in the burning of that house. All of them echoed the same sentimentsthere was never any talk among any of the firefighters that 3210 Bunker Hill Road had ever been the site of any type of demonic possession. At this point I realized that my work on 3210 Bunker Hill Road was over. I had conclusively proven not only that the people who had lived in the house never had any children, but that there were absolutely no stories (not even any rumors) circulating among Mount Rainier residents prior to the release of those Prince Georges Sentinel articles in the early 80s that anything like a case of demonic possession had ever affected anyone living at 3210 Bunker Hill Road. The belief that the haunted boy had lived in that house was nothing more than an urban myth, classically spurred on by some irresponsible journalists. I was the first investigator to debunk this mystery. (The house still has a history, as at least two people, Martina Miller and Joseph Haas, had died there, possibly spurring on tales among the local youth of the house being haunted.) Still the nagging question remained: who was the boy and where did he really grow up? The haunted boy never lived in Mount Rainier, then, which meant I had to start from scratch and go back and study the notes and taped interviews I had accumulated. The information given to me by Dean Landolt continued to stick in my mind. He had related to me that Father Hughes told him that the boy had gone on to graduate from Gonzaga High School, a private Catholic school located in Washington, D.C. I rechecked Steve Erdmanns Fate article from January 1975 and noted that the boy was born on June 1, 1935. I figured that if the boy missed the 1948-49 school year, he probably graduated in 1954. Obtaining a 1954 Gonzaga High School yearbook proved to be no easy feat, but I located a copy nonetheless. I was surprised to discover that when a student graduated from Gonzaga, they would enter under his senior picture his full name, current home address, and the name of the parish in which he was a member. For the 1954 school year, there were five graduates who were members of St. James Church in Mount Rainier, Maryland: two from Mount Rainier, one from D.C. and two from Cottage City. I took those five names and checked their birth dates through Marylands various systems of vital recordsall public information. I knew that the individual who came up with a birth date of June 1, 1935 would prove to be the mysterious haunted boy. The first name I randomly selected matched up with that date of birth. For reasons that will later become obvious I will from now on refer to this individual as Rob Doe (a combination of previously used pseudonyms). 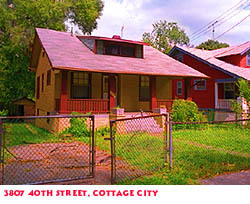 Robs home address was listed in the yearbook as being 3807 40th Avenue, Cottage City, Maryland. There was now no doubt that I had successfully identified the boy in question, something no other investigator had ever accomplished. Everything quickly fell into place as I searched for corroborating evidence. The first thing I did was check the family name and 40th Avenue address in the 1950 Prince Georges County Metropolitan Directory of the Mt. Rainier-Hyattsville-College Park Area at the Hyattsville Library. Indeed, the family was listed at that address. The investigation immediately picked up tremendous momentum as soon as I focused my efforts on the town of Cottage City, Maryland, the real home of the haunted boy. Entering a new phase of the investigation, I sought to determine how long the Doe family had lived at 3807 40th Avenue, Cottage City. I trekked down to the Martin Luther King Memorial Library in Washington, D.C., whose third-floor Washingtoniana Division contains a complete collection of Washington, D. C. and Suburban Maryland phone directories dating back to the 19th century. I conducted a thorough search of these directories (which are stored on microfilm) and discovered that the very first publication of the family name in question appeared in the Boyds District of Columbia Directory-1935 (D. C.: R. L. Polk & Company) under a Brentwood listing. The family was listed at that location through 1939. According to the Boyds District of Columbia Directory: Vol. 1940, the family was listed as residing at 41 Central Ave., Cottage City, Maryland. Running back to the Prince Georges Historical Society, a check with the Franklin Survey Companys 1940 Atlas Of Prince Georges County, Maryland, Volume 1, revealed that at that point in time, what would soon become 40th Avenue in Cottage City was still called Central Avenue. This verifies that the Doe family had been in the house at 3807 40th Avenue since at least 1940 (I later verified that they moved into this house in 1939). Subsequent checks revealed that the street name did indeed change to 40th Avenue in 1942 and the family was at that address until 1958. Immediately I realized that the priests involved had most likely identified the town of Mount Rainier as the boys home to act as a smokescreen so that he could not be readily identified. has not been well for some time. She is in hopes of avoiding an operation. (I have been told that one local author stubbornly believes that the Doe family moved from their Cottage City home and rented the house at 3210 Bunker Hill Road, for a short while, then moved back to Cottage City. There is absolutely no evidence whatsoever for this pointless move. There is no connection between Joseph Haas and the Doe family and when I later interviewed dozens of Cottage City residents, they all confirmed that the family in question had always lived in Cottage City in the 40th Avenue houseand never moved until Mr. Doe sold it in 1958). Continuing on this Cottage City theme, the 1997 video release In the Grip of Evil shows a house in two separate sequences that they purport to be the home of the haunted boy. They dont identify its address, though representatives from Henninger Media Development, the producers of the video, revealed to me that it was the only address given for the family in the diary of the exorcism kept by Father Raymond Bishop (which was supplied to them by Thomas Allen). When I began my investigative work in Cottage City and visited 3807 40th Avenue, I immediately recognized it as the house in the video. Issue 20 of STRANGE MAGAZINE is available from the Strange Bookshop. This article is Copyright 2000,1999, Strange Magazine. All rights reserved. No part of this article may be retransmitted in any form without the express permission of Strange Magazine. Any use of this original, copyrighted material in any media without the permission of Strange Magazine will be vigorously prosecuted.